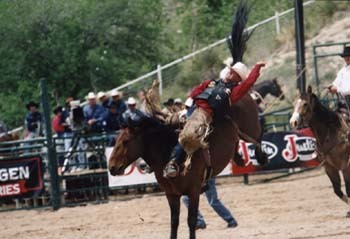 Mark received a very serious injury in July of 2000 at the Cheyenne Frontier Days rodeo. 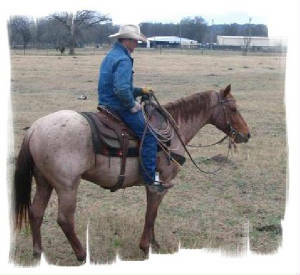 His horse, Sheep Tick, flipped over on top of him while leaving the chute,. The injury left him with a broken pelvis in three places, and out of rodeo for 6 months. May 2001 at Guymon, OK, Mark was forced to confront his fear head on, when he again drew Sheep Tick. He was obviously nervous, but he knew that he had to get back on him. He went behind the chutes with Scott Johnston and Chance Dixon, and prayed that God would give him the strength and the peace to ride. Mark got on and rode him for 87 points - breaking the arena record and winning the rodeo!